The idea for the Atlanta Rock 'n Blues Camp began in the spring of 2005. Our original inspiration was "Chicago" Joe Jones, who was encouraged to start the camp by the parents of some of his students, who believe his approach to teaching and performing merited a wider audience. Along with colleagues who share a unique set of skills and qualities that make them unusually qualified to lead a camp for young musicians, we opened a camp for those who wish to explore first hand the experience of being in a band and playing rock and roll, blues, and jazz. These performing musicians and teachers possess a level of skill which has come from a lifetime of performing and teaching kids, and their combination of patience, understanding and just plain "cool" makes them fun to work with and inspirational. 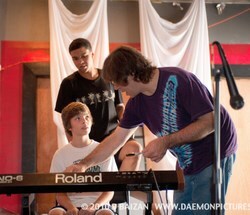 We keep our camp small in order to have direct contact with all of the campers and meet their individual musical needs. 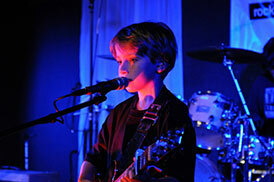 All of us at Atlanta Rock 'n Blues Camp are dedicated to the development of young musicians. Although we expect our campers to work hard during the week, we know that when they perform their program at the end of the week, the pride and excitement they and their parents will experience will make it all extremely worthwhile. Players interested in forming a band of like-minded camp-aged players and singers should email Micki Gonzalez, at info@rockandbluescamp.com. Please include your phone number and the name and email address of your parent. In order to ensure privacy we will handle requests by phone conversation, and seek permission from a parent.